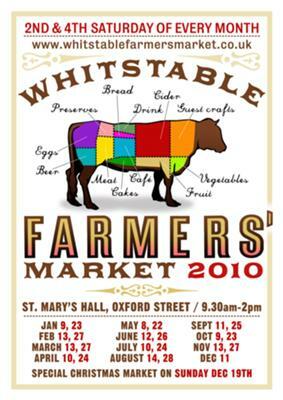 All stalls sell their own produce and come from within 25 mile of Whitstable - most are a lot closer, ensuring freshness, great flavour and high quality. We have organically grown seasonal vegetables, organic apple and pear juice, home cakes and savoury pastries. The Cheesemakers of Canterbury sell their delicious range of Ashmore and goats cheeses and there are olives that are processed and dressed in Whitstable. There are two bread stalls - one selling a range of different high quality types of bread, and the other specialising in yeast free "slow" bread. The "eggiest" tasting organic free range eggs - get there early not to miss out. There are also 3 meat stalls to choose from - organic, free range and wild game. Home made organic soap, vegetable plants in season, home made curry, preserves and honey. Fair trade cafe with hot snacks. Join in and write your own page! It's easy to do. How? Simply click here to return to Farmers Markets Kent.